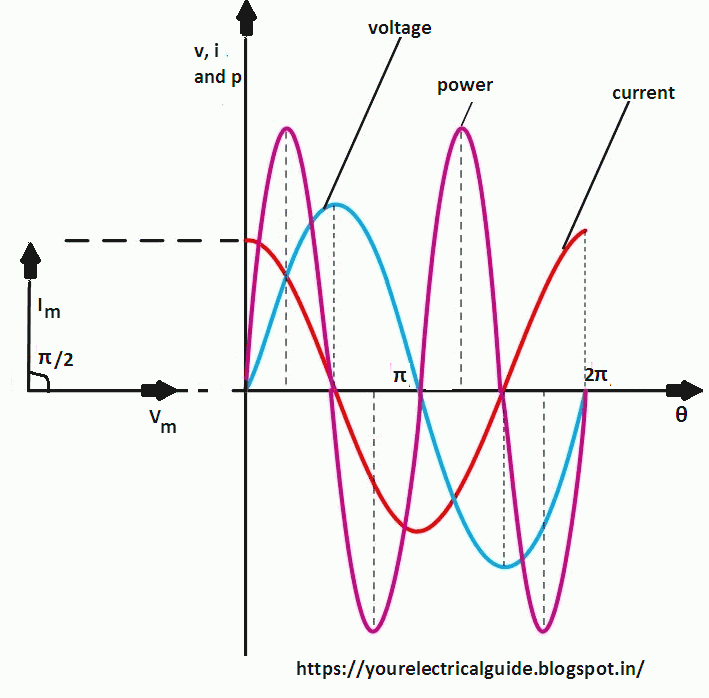 All AC circuits are made up of the combination of resistance R, inductance L and capacitance C. The circuit elements R, L, and C are known as circuit parameters. 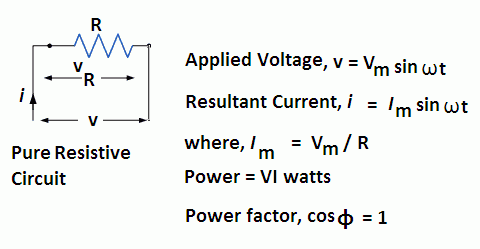 To study a general AC circuit it is necessary to consider the effect of each parameter separately. A purely resistive circuit is a circuit which has inductance so small that at normal frequency its reactance is negligible as compared to its resistance. In a purely resistive circuit whole of the applied voltage is utilized in overcoming the ohmic resistance of the circuit. A purely resistive circuit is also known as the non-inductive circuit. From the expression of instantaneous applied voltage and instantaneous current it is evident that in a purely resistive circuit, the applied voltage and current are in phase with each other. 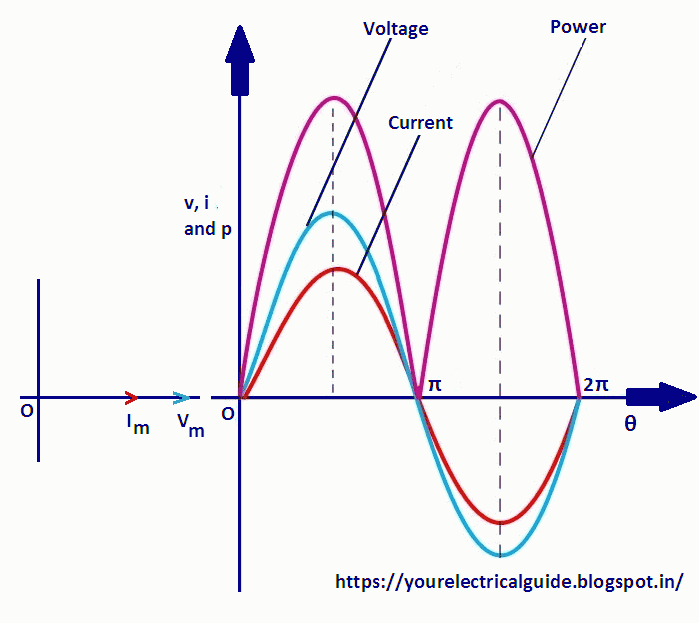 It is seen from the power curve for purely resistive circuit no part of power cycle becomes negative at any time i.e. in the purely resistive circuit power is never zero. This is so because instantaneous values of voltage and current are always either positive or negative and hence the product is always positive. 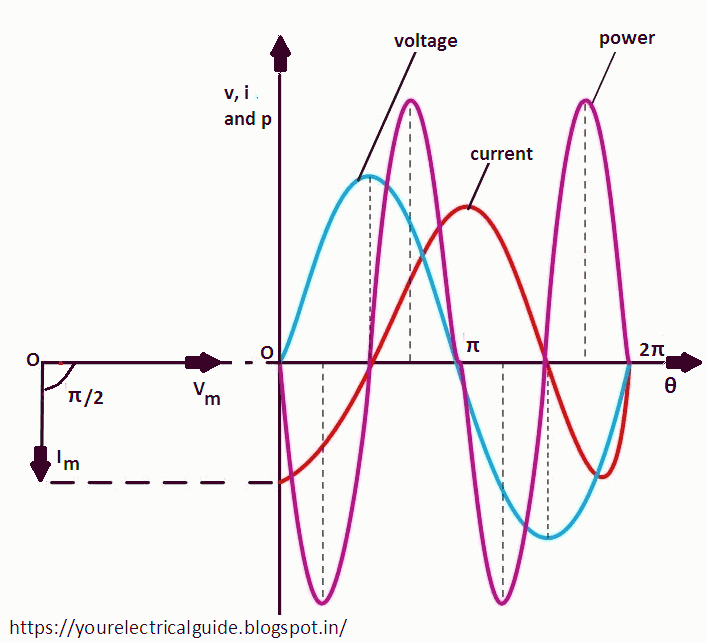 The frequency of power cycle is double that of the voltage and current waves. The power factor of the purely resistive circuit (cos φ) is 1. A pure inductive coil is that which has no ohmic resistance and hence no I2R loss. A pure inductance is practically not attainable, though it is nearly approached by a coil wound with such thick wire that its resistance is negligible. Whenever an alternating voltage is applied to a purely inductive circuit a back EMF is produced due to self-inductance of the coil. The back EMF, at every step, opposes the rise or fall of current through the coil. As there is no ohmic voltage drop, the applied voltage has to overcome this self-induced EMF only. From the expression of instantaneous applied voltage and instantaneous current flowing through the purely inductive circuit, it is observed that the current lags behind the voltage by π/2. The power curve for the purely inductive circuit is shown in the figure. It is clear that average power in a half cycle is zero as the negative and positive loop area under power curve is the same. In a purely inductive circuit, during the first quarter cycle, what so ever energy (or power) is supplied by the source that is stored in the magnetic field set-up around the coil. In the next quarter cycle, the magnetic field collapses and the energy (or power) stored in the magnetic field is returned to the source. Hence, no power is consumed in a purely inductive circuit. The opposition offered to the flow of an alternating current by the inductance of the circuit is known as inductive reactance. In fact, it is a property of all inductors. It is denoted by XL. where, f = frequency in Hz; L = inductance in henrys. The unit of inductive reactance is ohm. The inductive reactance of a given inductor is directly proportional to the frequency of applied voltage. It means inductive reactance increases linearly with frequency. When an alternating voltage is applied to a purely capacitive circuit, the capacitor is charged first in one direction and then in the opposite direction. From the expression of instantaneous applied voltage and instantaneous current flowing through the purely capacitive circuit, it is observed that the current leads the voltage by π/2. The power curve for the purely capacitive circuit is shown in the figure. It is clear that average power in a half cycle is zero as the negative and positive loop area under power curve is the same. In the purely capacitive circuit, during the first quarter cycle, what so ever energy (or power) is supplied by the source is stored in the electric field set-up between the capacitor plates. In the next quarter cycle, the electric field collapses and the energy (or power) stored in the electric field is returned to the source. This process is repeated in every alternation. Hence, no power is consumed in the purely capacitive circuit. Capacitive reactance is the opposition offered to the flow of alternating current by the capacitance of a capacitor. In fact, it is a property of all the capacitors. It is denoted by XC. where, f = frequency in Hz; C = capacitance in farad. The unit of capacitive reactance is ohm. 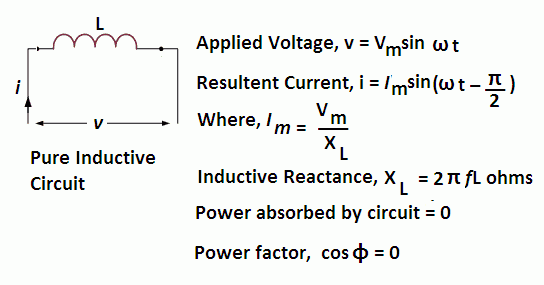 © https://yourelectricalguide.com/ power curve for purely resistive circuit.